Looking to keep in touch with electricity and power news related headlines? We have created a news feed, which you can easily subscribe to via RSS feed and email. 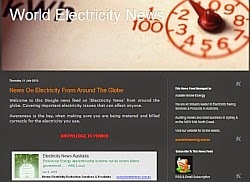 Alternatively visit WORLD ELECTRICITY NEWS. This blog post brought to you by Aussie Home Energy, a major player in the HOME ELECTRICITY SAVING SERVICE industry in Australia. We have in the past disabled comments due to spam. It is in the interests of our readers for comments on posts to be meaningful and related to the post in question. We value your input where it is going to add value to our blog. An industry leader in Electricity Saving Services & Products, servicing Sydney & the NSW Mid North Coast. Monitor It To Manage It! Are All Time Of Use Electricity Tariffs The Same? WHAT COULD YOU BE SAVING? Copyright © 2010-2017 Aussie Home Energy. All Rights Reserved. Simple theme. Powered by Blogger.